Its that time of year again … go to your storage unit and dust off the Halloween costumes for you and your kids. Also stock up for the treats that you will inevitably also be giving out to ghouls and ghosts that come knocking at your door! Have you thought, however, about asking for a trick instead of giving out a treat …? We at Metro Storage have been doing some digging about and have come up with 5 Top Tricks for Halloween. How to: Hide in the closet. Tell your friend to ask your other friend for something in said closet. As friend opens closet, squeeze airhorn. Observe reaction, indulge in uncontrollable laughter, and never look back. How to: Screw hook into ceiling above couch. Tie clear fishing line to spider and drape over hook, leaving more than enough fishing line to hold on to. Hide behind couch or curtains. As soon as friend sits down, release extra fishing line, propelling the spider on to the friend’s head. Laugh, point, and make sure someone catches it on video. How to: Cut holes in old cushions and pillows to create “wearable chair suit.” Sit in real chair like you actually are a chair. Have friend drape blanket over your head. Make sure you can still breathe. Have friend number one direct friend number two to take a load off and have a seat. As friend number two sits down, forcibly wrap your arms around them while moaning. Continue moaning. How to: Cut holes in empty pizza boxes. Place pizza boxes on skirted table. Hide zombie under skirted table with head shoved through holes in pizza boxes. Encourage party goers to have some pizza. Record reactions filled with sheer terror and upload to Facebook immediately. Tag freely. How to: As your victim nonchalantly walks down the hallway, send your gaggle of prankster friends running and screaming past the victim. Just as your victim looks back, unleash the T-Rex, and have a very happy halloween. 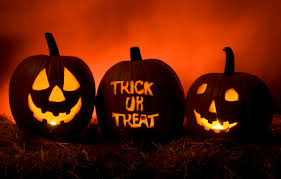 So … wishing you a very ‘happy’ Halloween from all at Metro Storage – London’s Best ALL-INCLUSIVE storage!